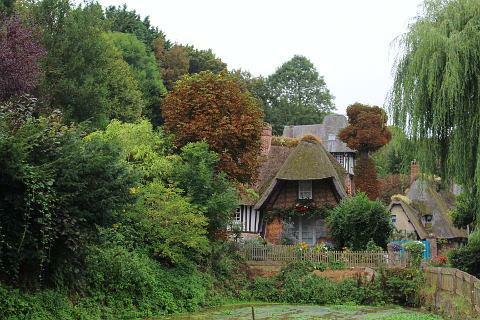 Veules-les-Roses is a 'must see' destination in the Seine-Maritime department of Normandy between Saint-Valery-en-Caux and Dieppe. In 2013 it came 6th in a national competition to find the favourite French village as voted by audiences of the French tv channel France2. 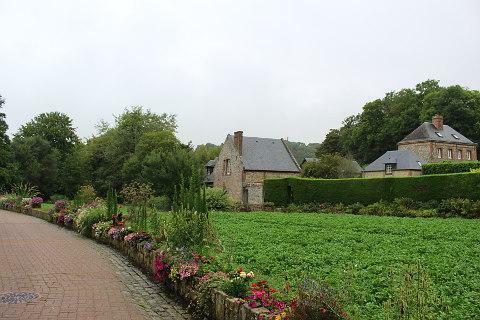 Park your car at the Parking des Sources on the western edge of town and take the little path that leads to the Cressonniere and the source of the river Veules. The cressonnieres are water-cress beds which are thought to date back to the 14th century and were once a very important winter salad crop which helped to prevent scurvy. 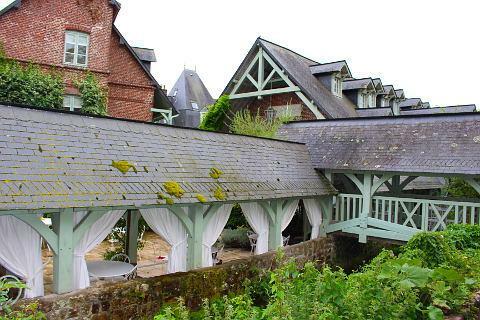 Now these peaceful beds are surrounded by a group of simply stunning houses, many of which have thatched roofs and half-timber walls. Surrounded also by a profusion of flowers you have the impression of having stepped straight into a chocolate-box setting! A little further along is the village watering hole where people used to come to water their animals. 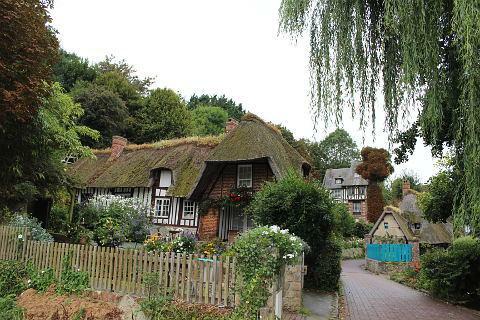 Next to this is a stunning black and white half-timbered cottage with a thatched roof. 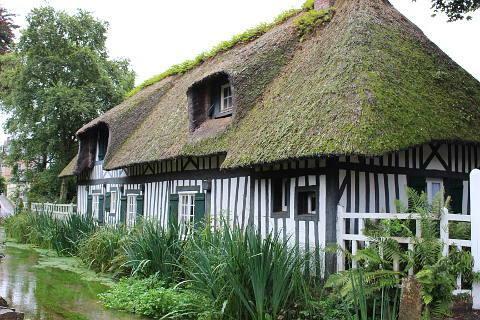 I noticed in Veules-les-Roses that many of the thatched roofs have a row of irises on their ridge - they must look lovely in the spring. 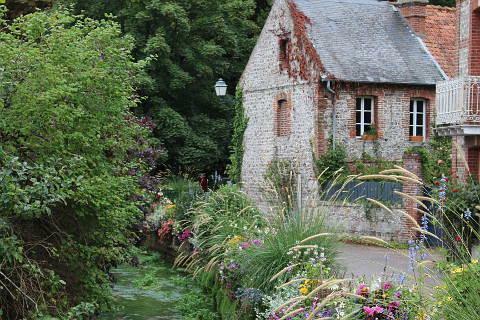 Continue towards the centre of the village and you next come to a section of the River Veules, which is incidently the shortest river in France, and you can head out the other side of the village along a riverside path which takes you past a number of charming water-mills. The path which is rather bizarrely called the "Champs Elysees", perhaps because many bourgeois Parisians once lived here, leads you past water mills and narrow streets and on to the Place Nicolas and the beach. The Place Nicolas has the ruins of a church and views over the sea. 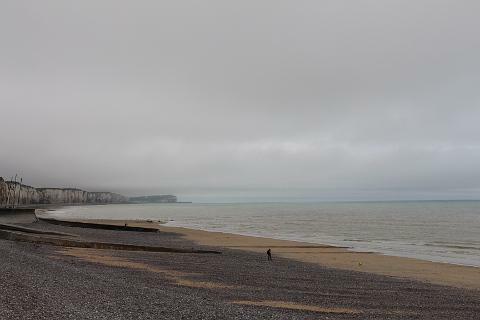 The beach at Veules-les-Roses is not one of the best on the Normandy coast, there is a lot more pebbled areas than sandy patches but non the less there is a beach and to either side the white cliffs that this region is famous for. Next to the beach is a paddling pool and children's playground. The beach at Veules-les-Roses was the embarkation point for 3000 British and French soldiers in June 1940 as part of the Battle of the Somme. Heading back to the centre of town the buildings are the lovely mix of flint and brick that is typical of the region and there are lots of little cafes and restaurants. One of the most impressive of the buildings is the ancient post house on the Grand Rue. 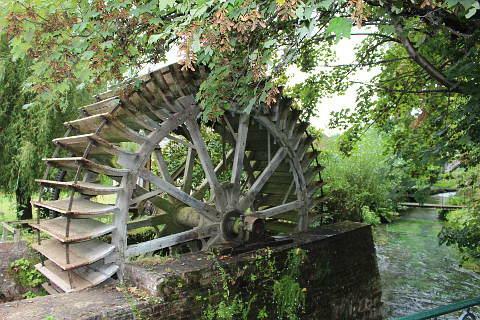 It is now an upmarket tea room and at the back you can sit out on the edge of the river. All in all this is a fabulous village not to be missed. 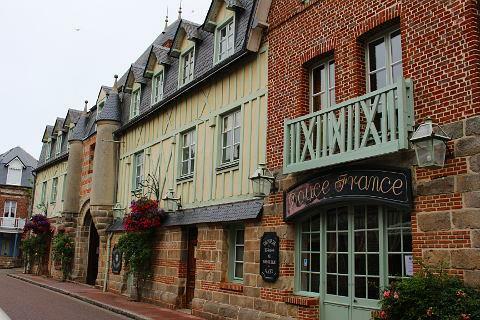 We are not at all suprised that it is a favourite village of the French! 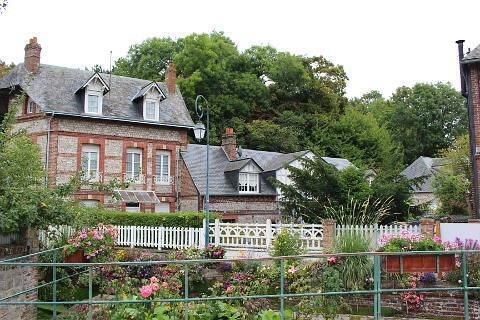 Victor Hugo was a frequent visitor to Veules les Roses when his friend and writer Paul Meurice lived here in the 19th century. 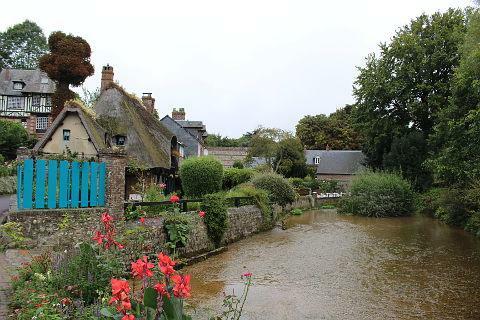 The seaside town of Saint-Valery-en-Caux is close to Veules-les-Roses to the west whilst a few kilometers to the east is Varengeville-sur-Mer which is another of the favourite villages of the French.